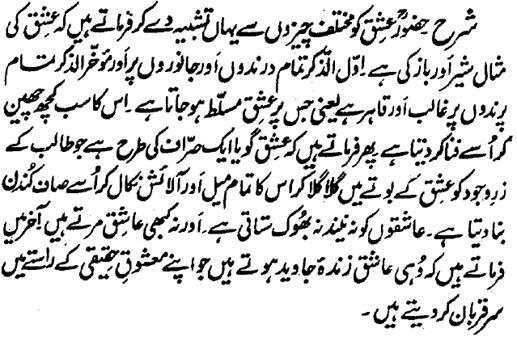 Hazrat Sultan Bahu Rahmatu-Allahe Ta-aala Alaihe resembles Ishq with different things here and says that the likeness of the Ishq is as the lion and hawk. Former is dominant and violent over all beasts and animals and later is on all birds. That is, Ishq occupies on him, it wills. It makes him Fanaa after seizing all that he owned. Then he says that Ishq is as if were a goldsmith which melts continuously the gold of the body of the Seeker in the crucible of Ishq and removes all impurity and contamination and turns it into pure gold. Aashiqeen are not dominated by sleep and hunger nor do they die. At the end, he says that only those Aashiqeen become living forever, who sacrifice their heads in the course of their Real beloved .